Extra enticement: There are times I’m convinced that somebody in Greece is secretly monitoring my email and text communications so they can plant my social media pages with photos, news and videos about places mentioned in my conversations. 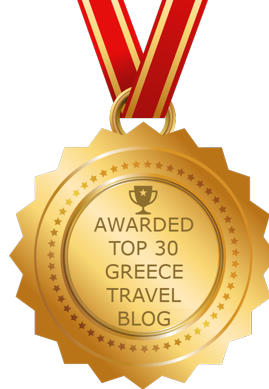 I couldn’t begin to count the number of times I have chatted with or messaged people about specific areas in Greece, only to see posts about those destinations suddenly appear on my Facebook page or Twitter feed soon afterward. It happened again this week after a friend texted to ask if I have been to Kalymnos, which she has been considering for an island hopping holiday in the Dodecanese this year. I haven’t been there yet, but I was able to refer her to Kalymnos rocks!, a post I published last year to showcase a video that four young Scottish rock climbers made when they visited Kalymnos to test their skills on its world-famous cliffs. Exhilarating landscapes and scenery in the 4-minute-long film convinced me that Kalymnos is just the kind of island my partner and I would thoroughly enjoy — so I promptly added it to our travel bucket list. Mere days after the text chat with my friend, two more Kalymnos videos curiously appeared in the news feed for the MyGreeceTravelBlog Facebook page, no doubt to tempt and tease me into wanting to visit the island even more. Sponsored by the Kalymnian Union of Attica, both clips were produced late last summer and show even more island sights and scenes than the fun rock-climbing film I previously shared on the blog. Since I have found myself contemplating a future trip to Kalymnos once again, I am sharing the clips here for the benefit of any readers who may be planning to spend some time on the island this summer. Meanwhile, in text messages a few days ago, my friend and I discussed Kefalonia and Lefkada, as well as some destinations in mainland Greece. Sure enough, my social media feeds quickly filled with images and information about both islands and the other places we had discussed. Spooky? Absolutely! But maybe it’s just a goodhearted online spy who is simply trying to assist with my holiday travel planning. Whether it’s purely coincidental or not, don’t be surprised if I start blogging about how much I would like to see Kefalonia, Lefkada and certain other places this summer! In the meantime, have a look at Kalymnos to see if it should be on your own Greek holiday bucket list. Sheer excitement: I’ve had Kalymnos on my mind all week after watching a splendid short video that was shot on the island by Kieran Duncan, an adventurous film maker from Scotland. Duncan’s nearly 4-minute-long film follows four young Scots who visit Kalymnos to test their skills at climbing some of its world-famous mountain cliffs and rock formations. Besides exhilarating and spine-tingling scenes of the lads scaling perilously steep rock walls, the film showcases the island’s marvellous mountain and coastal scenery, and gives viewers an impression of what it’s actually like to drive around the island. It also includes underwater scenes from a scuba diving session, and shows several spectacular sunsets. 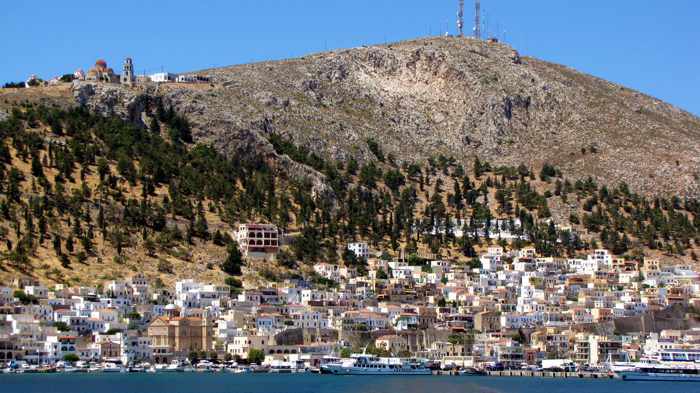 I haven’t set foot on Kalymnos yet, but I have seen parts of its coast as well as its main port town, Pothia, during a ferry ride from Kos to Patmos in 2010. At the time, I knew little about the island, apart from being vaguely aware of its long and storied history of sponge diving. I later learned that Kalymnos is nowadays more noteworthy as a challenging rock climbing destination for adventure sports enthusiasts from around the world. I haven’t done any rock climbing since I was a kid, and wouldn’t plan a holiday in Greece just to give it another try. But after discovering Duncan’s film earlier this week, I couldn’t get the captivating Kalymnos scenery out of my head. From quick online research, I Iearned that the island offers excellent hiking opportunities in addition to its popular climbing, diving and water sports activities. Since my partner and I are avid Greek island walkers, this information instantly made Kalymnos even more appealing as a destination for us to include on a future island-hopping trip in the Dodecanese. But what really “sold” me on Kalymnos were comments Duncan included on the Vimeo page for his film. ♦ Kalymnos — The real island experience is the official tourist website operated by the Municipality of Kalymnos. It features dozens of photos along with helpful information about the island’s history, arts and culture, traditional products, places to visit, and sports activities. ♦ Kalymnos Info is a travel guide loaded with details about activities, accommodations, dining, excursions, transportation, and more. ♦ Climb Kalymnos is an excellent online resource and practical guide for rock climbing enthusiasts, with a climbing route database and regular news updates. ♦ Kalymnos Climbing is a commercial site that offers guided rock climbing and climbing courses on Kalymnos. It has a dedicated section describing available hiking and trekking holidays on the island. ♦ The Kalymnos page on the Discover Greece travel portal lists island highlights and must-see attractions, and includes a number of beautiful photos. ♦ Diving the Skafandro suit, by Sandra Hendrikse and André Merks, is a fascinating article about the rise and decline of the island’s historic sponge fishing business. A mountain looms large behind Pothia, the main port of Kalymnos island. I snapped this photo during a brief ferry stop in May 2010, when we were travelling from Kos to Patmos.